To investigate how to best support implementation of such laws and help communities to successfully complete formal land documentation procedures, the International Development Law Organization (IDLO) undertook a randomized control trial entitled the “Community Land Protection Initiative.” The investigation was carried out from 2009 to 2011 in three countries in cooperation with national NGO partners: the Land and Equity Movement in Uganda (LEMU), Centro Terra Viva (CTV) in Mozambique, and the Sustainable Development Institute (SDI) in Liberia. The study’s objectives were: to facilitate the documentation and protection of customarily held lands through legally established community land titling processes; to understand how to best and most efficiently support communities to successfully protect their lands; and to support communities to establish mechanisms to address intra-community injustice and discrimination during community land titling processes. To undertake the objectives, twenty communities in Mozambique worked to complete the community land delimitation process set out in Mozambique’s Lei de Terras (1997), and 18 communities in Uganda worked to form Communal Land Associations and then seek a freehold title or Certificate of Customary Ownership (CCO) for their lands according to the procedures set out in the Land Act (1998) (Ch 227). In Liberia, due to the President’s moratorium on public land sale and the suspension of all public land sale processes (as set out in the Public Lands Act 1972-1973), the 20 study communities followed a skeletal process set out in an MOU signed between IDLO, SDI and the Land Commission of Liberia. Completion of necessary administrative steps, including formal surveying/GPS-ing and completion of application forms, etc. Project researchers tracked each community’s progress through the community land documentation process, observing and recording all obstacles confronted and their resolutions, all intra- and inter-community land conflicts and their resolutions, and all internal community debates and discussions. A pre- and post-service survey of over 2,225 randomly selected individuals and more than 250 structured focus group discussions supplemented these observations. Critically, the resulting analysis sheds light on a potential solution to the global land grab – how to best support communities to proactively protect their land rights in advance of concessions. Most importantly, we found that community land documentation activities should combine the technical task of mapping and titling community lands with the peace-building work of land conflict resolution and the governance work of strengthening land and natural resource management. Indeed, when these efforts are joined, community land titling and registration efforts have the potential to foster profound changes that go far beyond documentation. In our work supporting rural communities to document their lands, we have observed remarkable changes: communities wrote down their customary rules for the first time in living memory, debated these rules, and then revised them to protect women’s rights, hold local leaders accountable, and align community norms and practices with national law. Community members also revived old rules and created new ones to require sustainable natural resources management and conservation. 1. Community land documentation is a more efficient method of land protection than family and individual titling, and should be prioritized over individual/family titling in the short term. As undertaken in this investigation, for a hypothetical community of 500 families and large common areas, registering the whole community at once would cost less than half of efforts to register individual or family lands. Once the community as a whole has been protected, the focus may turn to community-driven documentation of family and individual lands. The establishment of consistent norms and institute clear, publicly known penalties for infractions. The alignment of local custom and practice with national law (after learning about national laws relevant to community land and natural resources administration, community members took steps to modify local rules so that they no longer contravened national law). However, in those communities that did not progress past a first draft of their community rules, community members did not report positive impacts on intra-community governance. Such findings indicate that a community land documentation process that does not include mechanisms to improve local governance and increase community leaders’ accountability may at best be described as a lost opportunity to effect powerful intra-community change, and at worst may make land dealings more unjust. To permit a community to apply for land documentation without carefully creating and implementing systems for transparent, just and equitable administration and management of that land is an invitation for mismanagement, corruption, and local elite capture. 3. Community land documentation processes are just as much conflict resolution processes as documentation and registration processes, and should be treated as such. The process of harmonizing boundaries with neighbors unearthed every latent, unresolved land conflict – long dormant or festering for years – as well as created new boundary disputes that flared up in response to the impending documentation efforts. The very exercise of drawing definite boundaries created a situation in which people were jockeying to claim as much land for their families as they could before the boundaries were finalized. As intra-community conflicts arose, community cohesion and cooperation often weakened, and rumors and accusations emerged. Inter-community land disputes revived memories of past conflict and reinvigorated divisions between families and clans. Boundary harmonization was therefore the beginning of serious intra- and inter-community conflict, even in communities that previously reported no boundary disputes and generally peaceful relations with their neighbors. However, while the potential for conflict was significant, communities’ desire to obtain documentation for their lands created a strong impetus for them to peacefully resolve long-running boundary disputes. To this end, communities adopted a wide range of conflict-resolution and compromise strategies, sometimes settling decades-old land conflicts. 4. The community land documentation process provided an opportunity for women and other vulnerable groups to actively challenge discriminatory customary norms and practices and argue for the inclusion of stronger protections for their land and inheritance rights. Their efforts resulted in the strengthening of existing women‘s rights, the rejuvenation of customary norms that had existed in the past to protect women‘s land claims but have recently eroded or been abused; and the alignment of local rules with national laws that protect women’s land rights. The process also appears to have shifted community members’ perceptions that land is “men’s business:” women reported that they felt that their opinions were taken seriously during the by-laws/constitution drafting discussions and many communities’ by-laws include new provisions that women and youth must have elected representatives on permanent governing bodies responsible for community land and natural resources management. Unfortunately, many of the first draft lists of the communities’ rules for land and natural resources management included rules that undermine women’s land rights and directly contravene national laws. In those communities that did not progress through the by-laws and rule-drafting process, no changes were made to remedy gender-based injustices or establish intra-community mechanisms to protect women’s and other vulnerable groups’ land rights. Such findings lead to the conclusion that a process of cataloguing, discussing and amending community rules is central to efforts to protect women’s rights during community land documentation activities. A contract is drafted to ensure that all community benefits are paid. 6. Paralegal support was found to be the optimal level of support for communities to progress most effectively through the community land documentation process. Cross-national statistical analysis of the study communities’ progress suggests that communities led by local, elected “paralegals” progressed farther through the community land documentation process than all other communities, including those communities given full legal support by lawyers and technical experts. This outcome may indicate that leaving communities with the responsibility of completing most project activities on their own motivated them to take the work more seriously, integrate and internalize the legal education and capacity-building training provided more thoroughly, address intra-community obstacles more proactively, and claim greater “ownership” over the community land documentation process than when the work is done for the community by outside lawyers and technicians. However, the findings indicate that while motivated communities can perform much of this work on their own, they need targeted legal and technical assistance to successfully complete community land documentation efforts. 7. Administrative or bureaucratic impediments linked to lack of necessary staffing and state resources, lack of political will, and other government obstacles have proved to be the greatest barriers to successful community land documentation. 8. Community land documentation processes are not for all communities. If a community starts the community land documentation process and does not see it through to completion, the process may increase conflict and tenure insecurity in the region. 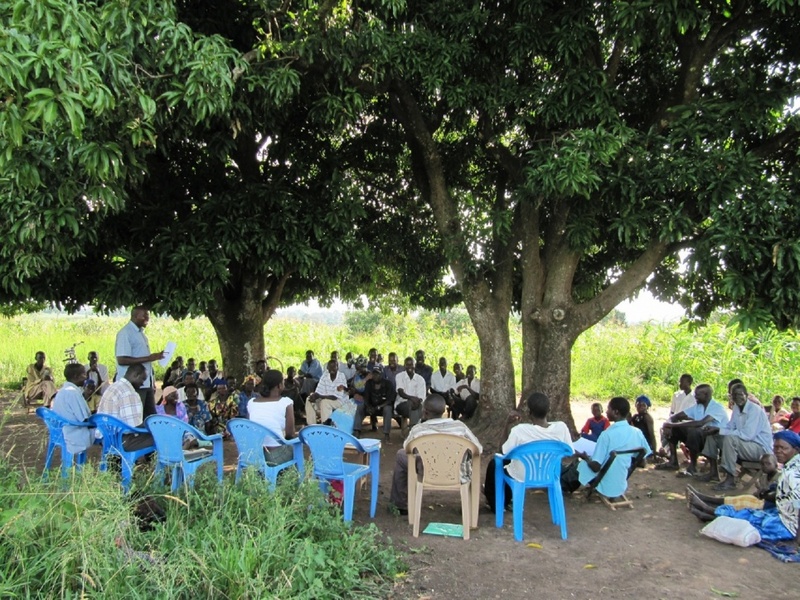 The field teams’ observations illustrate that communities that struggle with elite sabotage, intractable boundary disputes that cannot be resolved through intensive mediation, internal discord, and weak leadership or power struggles between leaders may not be able to successfully progress through community land documentation processes, irrespective of how much support they are offered. Similarly, peri-urban communities and communities with little or no internal cohesion or a highly transient population may not be appropriate for community land documentation initiatives. Should a dysfunctional community initiate land documentation efforts and not be able to complete them, the process may invigorate tensions and create or exacerbate conflict, leaving the community in a worse situation than before the intervention began. Supplemental conflict resolution training, community-building and leadership-enhancement activities may need to be provided before a community can undertake land documentation efforts. The conclusions of the Community Land Titling Initiative’s two-year investigation are necessarily preliminary, due to the very short study period and because, as a result of the various administrative, state capacity and regulatory obstacles described above, none of the study communities have yet been issued their titles, deeds or delimitation certificates. Further research is therefore warranted. Additional investigation is also necessary to determine the long-term social and economic impacts of documenting community land rights. Moreover, it will be critical to provide on-going support and monitoring to understand how to best support community efforts to implement their newly-adopted by-laws/constitutions and land and natural resources management plans, and to discern what additional assistance is necessary to ensure that even documented community lands claims are protected over the long-term. To this end, Namati, a new international organization dedicated to expanding the field of legal empowerment, is taking this work forward, as its global Community Land Protection Program. The Community Land Protection Program’s goal is to proactively strengthen communities’ ability to protect, enforce and defend their customary land rights. The program endeavors to promote genuine legal protections for customary land tenure and the recognition of customary land rights as legally enforceable ownership claims. In Liberia and Mozambique, the communities worked to document the perimeter of the entire community (the meta-unit), including within it both privately held family lands as well as all communal lands, water sources and forests. In Uganda however, the project was working to document and protect only communities’ large common grazing lands. This entry was posted in Guest posting, Resources and tagged community titling, customary law, customary tenure, gender, IDLO, indigenous groups, land administration, land rights, land-rush, legal empowerment, Liberia, Mozambique, Namati, titling, Uganda. Bookmark the permalink. An informative, extremely helpful report on a community land-titling project in Africa. We’ll try to incorporate some of their findings in our current and future projects.